Radiotherapy procedures use sources different variety of sources with different activities. These procedures require personnel protection from primary sources such as beta’s, gammas and x-ray photons, and secondary scattering radiation. To enable viewing into the patient or procedure room, a ClearView Windows are placed in a wall. 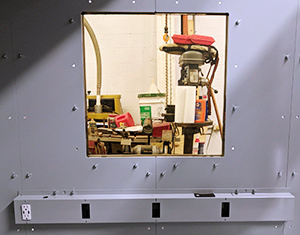 ClearView Radiation Shielding windows provide large viewing windows and protection against beta, gamma and x-ray radiation. The housing of the ClearView window solution is constructed of impact resistant polycarbonate. The polycarbonate wall thickness will be determined by the size of the window. The window has sufficient strength for withstanding and holding the construction together. 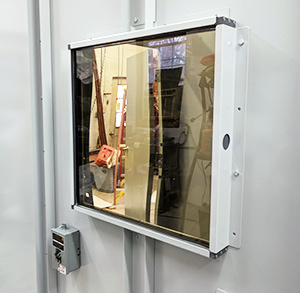 ClearView windows provides a large viewing window while protecting hospital staff and family members from Co60, Cs137, I131, Sr89, Y90, high and low energy X-rays, etc. used inpatient treatments. Transparent shielded ClearView windows in medical procedure rooms enable easier interaction between the patient, family and hospital staff. Doctors and hospital staff working in aforementioned clinical procedures have limited or no visibility during the treatment process. They are exposed to high dose rates and high cumulative doses. Such conditions make having shielded and protective viewing windows very helpful.